Integration is better than segregation. This is an American value. We need to use the same schools, the same community resources, the same places. We need access to the same materials, literature, and social standing. The civil rights movement showed us that this is true. And years working with developmentally disabled adults have drummed this home for me. Integration always trumps segregation. In the marketplace of ideas, however, the trend is usually towards segregation. Even in existentialism. This often has a profit motive. Fritz Perls, for example, demurred when asked if he was an existentialist. While he toyed with calling Gestalt an existential approach, he preferred to be an adherent of his own thinking first. There was academic prestige and potential profit in this motive. Frankl, an existentialist icon, is guilty of exactly the same maneuver, protecting Logotherapy as his own creation rather than part of a broader dialogue on meaning in therapy. Similar motives drive us to develop new therapies all the time, or slap new labels on old ones and call them our own. We increasingly segregate our ideas into ever more rarified (and, potentially, reified) forms of psychology and psychotherapy. In doing this, we move ever away from the things that underlie effectiveness and towards ever more systematic fields in which the language is strictly controlled and theory and language tightly regulated. The mothers and fathers of psychology thereby become proprietors rather than philosophic founders, because all the thoughts and practices become proprietary. When I write seriously these days, all my work is integrative. My dissertation integrated family systems and existential work. A recent article with several friends and colleagues begins to integrate both of these with international psychology, and also some psychology of religion. An article in press begins to integrate neuropsychology and existential psychology. Another, in the formative phases, looks at behaviorism from an existential perspective. This is written with a friend who works as a behaviorist but whose approach is deeply humanistic and respectful. 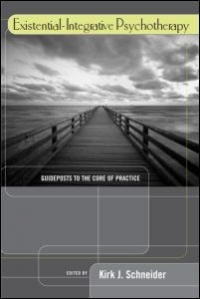 This drive to integrate is perhaps inspired by Kirk Schneider’s Existential Integrative Psychotherapy: Guideposts to the Core of Practice. He makes an excellent case that the things that make existential psychology tick are really the things that underlie good psychology. In modern times, existential psychology is sort of an add-on, a specialization acquired once we have a solid basis in psychology overall. However, we could easily reverse this position, and use existential thought as a foundation from which to discuss other approaches. What does it mean, for example, to approach behavior from an existential standpoint? It means we are interested first in outcomes that are existentially valued. We need to increase the freedom of the individual as our first goal, which seems to be at odds with a behaviorist intervention which seeks to control behavior. We can make the case, however, that this is illusory, and that we really share the same goal. The behaviorist’s first job is to discover the intentions behind a given behavior. The behaviorist will then try to teach a more efficient behavior and reinforce it, ignoring the old behavior (but not the person). If we do this, we have increased the freedom of the person we are working with. Initially, they knew about one behavior. Now they know about two behaviors and can choose between them. No coercion is offered in the form of punishment for ‘bad’ behavior. Returning to the original motif of integration as a human rights requirement, we can see here that integrating motivations of existential liberation with behaviorism results in an approach that is more respectful and increases the freedom of the people we work with. Behaviorism is used most often with people who cannot express their internal condition, often adults with developmental disabilities. Not coincidentally, this is a group whose civil rights movement is still in progress. Integration is a field full of potential and all but empty of players. It is even difficult to find established methodologies for doing the work of integration. In writing my dissertation, I really developed my own methodology. But the work is perhaps of real importance. In an age when people are brainwashed into thinking all their feelings are illnesses that need to be treated to the profit of pharmaceutical companies, integrating psychological approaches from the position of existential psychology is a much-needed movement. Valuing first liberation and dignity, and holding each person in awe rather than reducing them to unruly chemicals, is a first step in taking back our profession from a medical establishment that was reluctant to let it go in the first place.